For the first time in the 12 year history of the Greencars.org Greenest Vehicle List, an electric vehicle has topped the list, based on the 14th annual comprehensive environmental rankings provided by the American Council for an Energy-Efficient Economy (ACEEE). 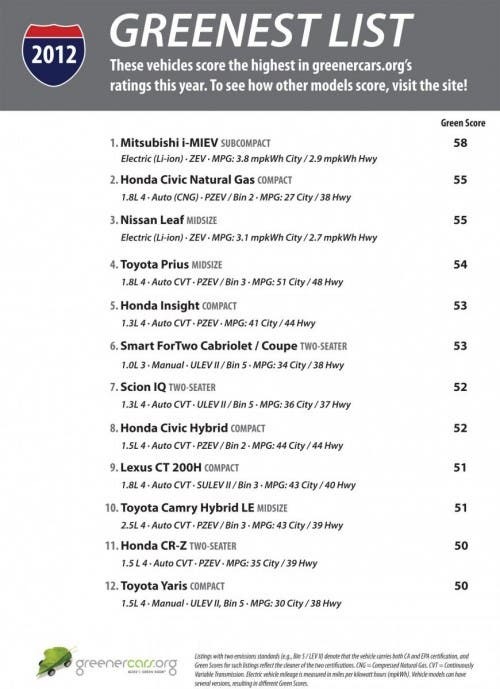 The Mitsubishi i-MIEV battery electric vehicle claimed the top spot from the Honda Civic Natural Gas which, up until this year, had held the top spot for 8 years running. The i-MIEV scored a high score of 58, the highest Green Score ever awarded since the ACEEE rankings were started back in 1998. The Mitsubishi i-MIEV managed a combined city and highway fuel economy of 112 miles per gallon equivalent. “Even taking into account the emissions generated from the electricity used to power the i-MIEV, it still handily outscores other vehicles on the market today,” said ACEEE lead vehicle analyst Shruti Vaidyanathan. The remainder of the top 12 is made up of hybrids, which occupied half of all spots, as well as more conventional but highly efficient gasoline vehicles, which claimed three of the top spots. “It’s increasingly obvious that automakers are fully invested in providing consumers with the widest possible array of vehicle choices. Earning a spot on the “Greenest” list is proving to be a real challenge for automakers given the variety of vehicle technologies on the market and the proliferation of highly efficient conventional vehicles. Just using the latest technology does not guarantee a top spot,” said Vaidyanathan. As an example, several new hybrid options were released by Hyundai, Kia and Infinity, but none of these broke into the top twelve. Since the beginning of the process, the scores are based on measurements that include unhealthy tailpipe emissions, fuel consumption, and emissions of gases that contribute to climate change. This year, however, additional measurements were included to give a better picture of a vehicle’s impact on the environment, with improved emissions estimates for the vehicle manufacturing process, changes reflecting current natural gas extraction practices, and consideration of upcoming shifts in the generation mix for the electricity used to power electric cars. With any Best list comes the necessary Worst list, and this year saw a number of heavier ‘light-duty’ vehicles as the highest emitters. The list also provides a ‘Best in Class’ list which can be seen below—not surprising to see the Toyota Prius at the top of the Midsize category.